Mysidae includes 58 genera, although only two live in freshwater. 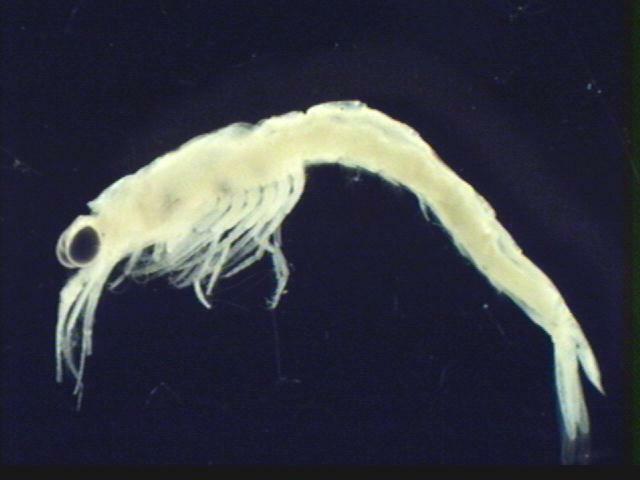 Mysis relicta (commonly called the opossum shrimp) is a relict species that evolved from an isolated Mysis oculata population that was confronted with decreasing salinity in areas influenced by melt water during the retreat of glaciers during the Pleistocene Epoch. Mysis relicta is the only member of the order Mysidacea found in the Great Lakes Region. This species is distinguished from all other planktonic Great Lakes crustaceans by the presence of two stalked compound eyes. The thorax is enclosed in a carapace dorsally and laterally. Swimming legs extend ventrally from the thorax. Mature females have plates on the last two thoracic segments which are used to protect developing eggs and young. Males do not have thoracic plates. The abdomen includes six segments. Each abdominal segment bears a pair of pleopods. Mature males have extremely elongate fourth pleopods that presumably aid in grasping the female during the act of mating. A pair of fluid filled cavities known as statocysts are found in the tail of Mysis. Each statocyst contains a small, dense particle. The position of this particle within its cavity provides Mysis with a sense of how it is oriented in its environment. Fish have similar particles known as otoliths, while humans use a fluid-filled cavity called the cochlea for the same purpose. Mysis relicta has a wide distribution which includes all formerly glaciated areas in the northern hemisphere. It has also been introduced to several areas where it was not previously found. These areas include lakes in Sweden, Norway, British Columbia, Montana and California. Deep, cold waters with high levels of dissolved oxygen are preferred by Mysis relicta. The species tends to inhabit deep oligotrophic lakes that provide ample oxygen and suitable temperatures during the heat of summer when stratified eutrophic lakes experience oxygen depletion in the hypolimnion. Mysis is a truly omnivorous filter feeder. Algae, detritus, and other zooplankton are all consumed. Diet may vary from lake to lake, season to season, and year to year depending on availability of food items and abiotic factors. This helps to explain some of the unexpected problems that have resulted from Mysis introductions in British Columbia and elsewhere. For example, in some instances cladocerans such as Bosmina and Daphnia are a major food source. In these instances, Mysis competes directly with planktivorous fish and larval fish for food resources. When cladocerans are not present (or they are not commonly encountered by Mysis) they will sometimes prey upon copepods instead (Lasenby and Furst 1981, Chess and Stanford 1998). In other instances, Mysis is primarily a phytoplankton grazer. Like all arthropods, Mysis has a chitinous exoskeleton that must be shed many times throughout the life of an individual to permit growth. Unlike some other arthropods, Mysis exhibits direct development and does not have a naupliar stage. In shallow areas of Lake Michigan, mating occurs in the winter. Males die after mating, but females remain alive for several months. Eggs are held in a brood pouch beneath the thorax of the female (hence the name opossum shrimp). Fertilization also occurs within the brood pouch. After 3-4 months, the eggs hatch into fully developed young. After birth, the young are known as stage I. Each stage, or instar, ends with molting. Typical lengths for molting at various stages follow: I - 4.5 mm, II - 9 mm, III - 12 mm, IV - 16 mm. At stage IV, individuals reach sexual maturity. Males do not have a fifth instar, but some females do. Total lengths of 22 mm have been recorded for fifth instar females. Growth is slower in colder lakes such as Lake Superior. The life cycle takes two years instead of one in some of these lakes. Figure 3. 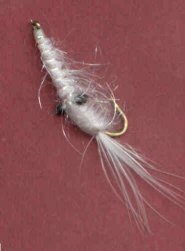 In areas where Mysis relicta is an important food source for gamefish, fly tiers have devised methods for imitating the creature. Rod Zavaduk tied this pattern for use in Kootenay Lake at night. Other anglers fish in tailrace areas below reservoirs that contain Mysis relicta. Some of these tailraces now hold record-class trout that prey almost exclusively on outflowing Mysis. Figure 2. Preserved stage II Mysis relicta under 10X magnification. This specimen measured 10 mm long and was taken from the shallows of Lake Michigan in June. Most life history studies on this species have taken place on Lake Michigan. Mysis relicta is a native organism in this oligotrophic home to countless exotic invaders. Mysis does not appear to be detrimental to coevolved native sport and food fish here. In fact, it is often listed as a primary food source for various sculpin (Cottidae), coregonids, and even burbot (Lota lota). There is some concern among managers that newly arrived exotic predatory zooplankters such as Bythotrephes cederstroemi and Cercopagis pengoi might compete with Mysis to the detriment of native fish stocks. 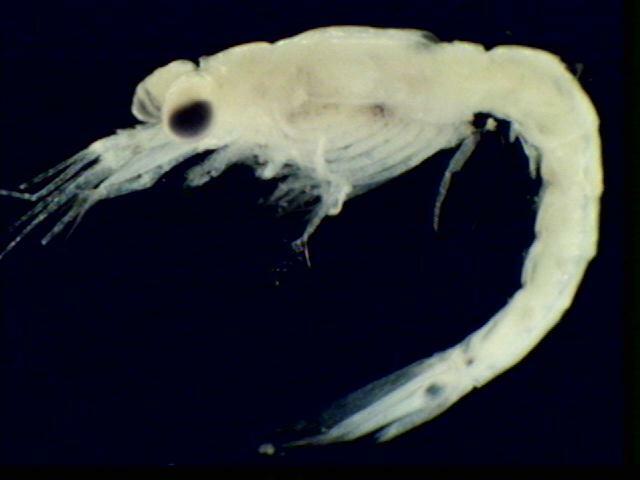 However, Grossnickle (1978) found that Lake Michigan opossum shrimp feed primarily upon phytoplankton. This suggested a lack of Mysis reliance on herbivorous zooplankton such as Daphnia. Lehman et al (1990) documented a lack of Mysis reliance on Daphnia in Lake Michigan and discovered that there is little spatial/temporal overlap between cladocerans and Mysis during the summer months. Since Mysis does not prey upon cladocerans heavily, it does not compete with young native fish. Kootenay is a natural oligotrophic lake that has been impacted by dams. Dams now control the water level of Kootenay and alter the function of feeder streams. Dams on tributaries now allow for the settling out of nutrients in upstream reservoirs, resulting in decreased nutrient input to Kootenay. Kootenay is home to a strain of large rainbow trout (Oncorhynchus mykiss)known as Gerrard trout. These are very popular sport fish that feed on the native landlocked strain of the sockeye salmon (Oncorhynchus nerka). In the 1940's, Mysis relicta was introduced with the hopes that Gerrard trout would feed heavily on them. Unfortunately, no increased growth of Gerrard trout was noted. Kokanee salmon appeared to benefit immensely, though. Within ten years, kokanee growth had skyrocketed due to predation on Mysis relicta by adult kokanee. This created a world-renowned sport fishery that lasted for several decades and spurred other managers to introduce the opossum shrimp to other areas where kokanee salmon existed. The Great Lakes Fishery Commission issued a technical report detailing the status of the fishery at this time. By the 1990s, kokanee populations were in trouble in Kootenay and the Gerrard trout followed. Several factors, including blockage of historical spawning sites with dams, decreased nutrient inputs, overexploitation, and competition between young kokanee and Mysis relicta were likely responsible. In response, artificial fertilization was attempted in one portion of the lake to test its effectiveness as a management tool. Models initially predicted that the fertilization would lead to increased Mysis relicta growth, and corresponding increase in competition with kokanee. Lisa Thompson studied the effects of this artificial fertilization and found that it did benefit the kokanee by increasing their small cladoceran food without leading to an explosion of Mysis relicta. This was attributed to outflow of Mysis relicta. In lakes with less current flow through outlets, fertilization will probably not be an effective method of increasing kokanee growth and abundance where Mysis relicta exists. Following the "success" of the Mysis relicta introduction in Kootenay, managers decided to do the kokanee salmon in Okanagan a favor. In 1966, they introduced the opossum shrimp. The expected benefit was never realized. Kokanee salmon and native kokanee predators crashed while Mysis relicta reached such high densities that a it became the focus of a commercial fishery. Mysis.com offers packages of frozen Onkanagan Lake opossum shrimp for use as food for aquarium fish. See the Kokanee Salmon Heritage Project web site for more information on Mysis and other causes of decline in the Onkanagan kokanee population. A long history of exotic species introductions have resulted in the decline of native westslope cutthroat trout (Oncorhynchus clarki lewisi) and bull trout (Salvelinus confluentus) in Flathead Lake. Exotic salmonids, including lake trout, kokanee salmon, and lake whitefish (Coregonus clupeaformis) were introduced in the 1910s to provide commercial and sport fisheries. By 1981, Mysis relicta (which was introduced to boost kokanee growth in upstream reservoirs in 1968) had become established in the lake. By 1986, densities up to 130 Mysis per cubic meter were recorded. Opossum shrimp densities have subsided and leveled off since then, but they have certainly altered the food web. Adult lake trout and whitefish prey heavily on Mysis due to the fact that they feed near the bottom during the daytime in the deep waters where Mysis dwells during the summer. Adult whitefish growth is comparable to historic growth, although young-of-year growth is down (Tohtz 1993). Kokanee, as well as the native bull and cutthroat trout, may prey on Mysis as adults but they seem to be having recruitment problems due to lack of cladoceran prey for young fish. A diet study of Mysis relicta in the lake revealed that its major food source is the cladoceran Daphnia thorata, which puts Mysis in direct competition with young salmonids (Chess and Stanford 1998). Figure 4. First instar opossum shrimp under 20X magnification. The opaqueness results from preservation in ethanol. Living specimens are transparent. For more information on mis-management issues related to Mysis relicta take a look at this AFS publication.